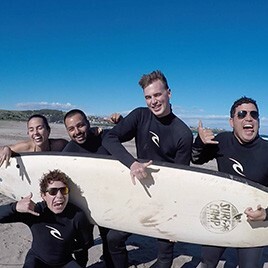 Learning to surf is a must-do while in Australia! ELC students spent the weekend doing just that, thanks to our onsite travel agent, Ultimate Oz! A group of students travelled to Seven Mile Beach for the weekend with Surf Camp Australia. You couldn’t ask for a more Australian experience - sunshine, surf lessons, the beach and a barbecue with new friends! Have a look at the photos on our Facebook page. The next ELC Surf Camp will be the weekend of 19th to 21st of April. Students can see Sarah at the Travel Desk on Level 1 for more information and to book.